Belle, a service dog in training, was named after the WWII Memphis Belle Bomber aircraft. We are excited to be partnering with Cosequin again, who has sponsored the training for this little lady! We can’t wait to watch this little southern belle grow into a wonderful service dog! Audie, a service dog in training, is named in honor of Audie Murphy, one of the most decorated combat veterans in history, having received every military award for Valor available from the US Army and the Medal of Honor. We are excited to partner again with the Robert Irvine Foundation and Chef Robert Irvine, who have sponsored his training with VSD! Revie Valor, a service dog in training, was named for the Reveille that plays every morning on a military base signifying the raising of the flag and the start of the day. We can’t wait to watch this little sweetie grow and learn! Chap Valor, a service dog in training, was named to honor a WWII veteran who became a chaplain after his time in the service. After two years of service in Italy and Algeria, Chap’s namesake was discharged and on his way home called his wife and said "find me a seminary". He never spoke of his time in WWII but his experiences changed him during that period and he decided on a change of career to become a minister. We know that Chap will make him proud! Ladd Valor, a service dog in training, was named after the father of our amazing vest maker. Her father was a Korean War veteran stationed at Ladd Army Airfield. Ladd is such a sweet little boy and we know that he will provide the love and comfort his forever veteran needs. Rucker Valor, a service dog in training, was named after Fort Rucker, an Army post in Alabama. Thank you to Operation Patriot Support - OPs for sponsoring this sweet boy and thank you to the cadets at the Sarasota Military Academy for naming him! Mia Valor, a service dog in training, was named in honor and remembrance of all those missing in action. Thank you to the Robert Irvine Foundation for sponsoring her! She is a feisty girl and we are sure that she will make us very proud! Reagan Valor, training to be the VSD Ambassador Dog, was named after the USS Ronald Reagan, which is a Nimitz-class, nuclear-powered supercarrier in the service of the United States Navy. This supercarrier was named in honor of Ronald W. Reagan, president of the United States from 1981 to 1989. Norman D. Valor, a service dog in training, was named in honor of those who served on D-Day at the Normandy landings. He will grow up to help his forever veteran and remind all of us of the sacrifices made during WWII. Higgins, a service dog in training, was named after the Higgins landing craft which was used to bring soldiers ashore on D-Day. He will go on to help a very deserving veteran and remind us of the sacrifices made during WWII. Bradley is named after the Bradley fighting vehicle. Bradleys were used to safely transport troops while offering protection. What a perfect name as Bradley Valor will help his future veteran safely navigate through life while offering unconditional support through all of life's challenges. Bradley graduated and was paired with his forever veteran in June 2018. Bomber is named after a Special Forces Vietnam Veteran whose nickname was Bomber. After serving time in Vietnam, Bomber was an unconventional warfare instructor and then became the Inspector General at Ft. Bragg. In 1977 he retired from the Army. Our puppy Bomber has big shoes to fill to live up to his name. 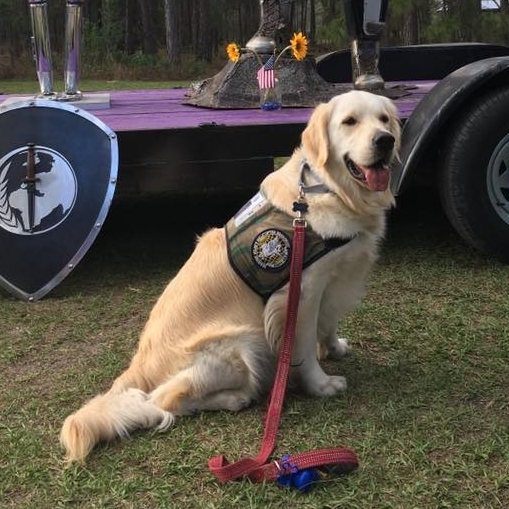 Bomber left the service dog program and was placed as a military family support dog in July 2017. Dimmer graduated and was paired with his forever veteran in March 2018. Huey is named for the Bell UH-1 helicopter. Hueys were notorious for their service in Vietnam, from transporting troops to medical evacuations and running air assault missions. They had a wide range of responsibilities as will our very own Huey Valor. Huey graduated and was paired with his forever veteran in May 2018. In 1915, during World War I, Canadian, Lt. Col. John McCrae penned the poem "In Flanders Fields" in honor of a friend that was killed by a German shell. The blood red poppy was able grow in the battle-scarred landscape and covered the graves of the fallen. Since its writing, the poppy has become the remembrance flower for those who have died in combat in several countries to include the United States. Poppy left the service dog program and was placed as a military family support dog in August 2018.